Central Works opened its 58th world premiere this past weekend with Bamboozled, a play written by Patricia Milton and developed in the company’s Writers Workshop. The play like so many of Central Works’ creations is political, full of ironic humor and blessed with a twisty-turny roller-coaster plot. The play takes place in a law office in a small town in Tennessee during February 2017. A young African American woman, Abby, has been accused of fraud by one of the local pillars of Southern womanly virtue, Opal Ann Hatchett, daughter of a Confederate general. 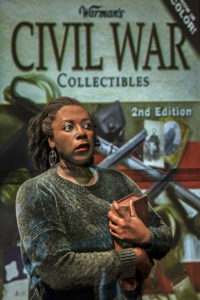 Abby is an expert on Confederate Civil War memorabilia, and she had been asked by Opal Ann’s nephew Caleb to estimate the value of a trunk full of family heirlooms. She estimated it at $60,000. It later comes out that a museum bought the collection for $1,000,000. Abby Howard (Jeunée Simon) is an “Antiques Roadtrip” appraiser accused of fraud in Central Works’ “Bamboozled”. Photo by J. Norrena. Further digging finds the collection was delivered anonymously to the museum and the money wired into an anonymous and inaccessible account in the Cayman Islands. So where did the money go? The smart, savvy and out-spoken Savannah (Chelsea Bearce) has her own issues with Rochelle, who was her lawyer when she was arrested for dancing with her hands on her girlfriend’s bum in a pub. Rochelle’s legal crusade led to Savannah’s own law license being suspended. Hence, Savannah’s lowly position in the law firm. Oh, it’s ever so much more complicated than that though. Outside, a Klan demonstration is going on, protesting the pulling down of a confederate monument. And inside the law offices, Opal Ann (Susan Jackson) appears, her purse laden with cosmetics and a gun. Savannah advises Rochelle, privately, to take a settlement. Opal Ann accuses Abby, Abby accuses Caleb. Savannah asserts that Abby’s sin is like Eve, whose “original sin was to agree to have a conversation with a snake,” in this case, Opal Ann. Somewhere along the line someone reminisces over having a lover who cooked heart-shaped bacon for her. It’s all funny, hectic and of the moment. Gary Graves directed. Props, sets and costuming are minimal but the venue and the fast-talking dialog are more than enough to keep the viewer engaged and on the edge of her seat. Central Works’ Bamboozled continues through March 18. For tickets and information, visit centralworks.org.